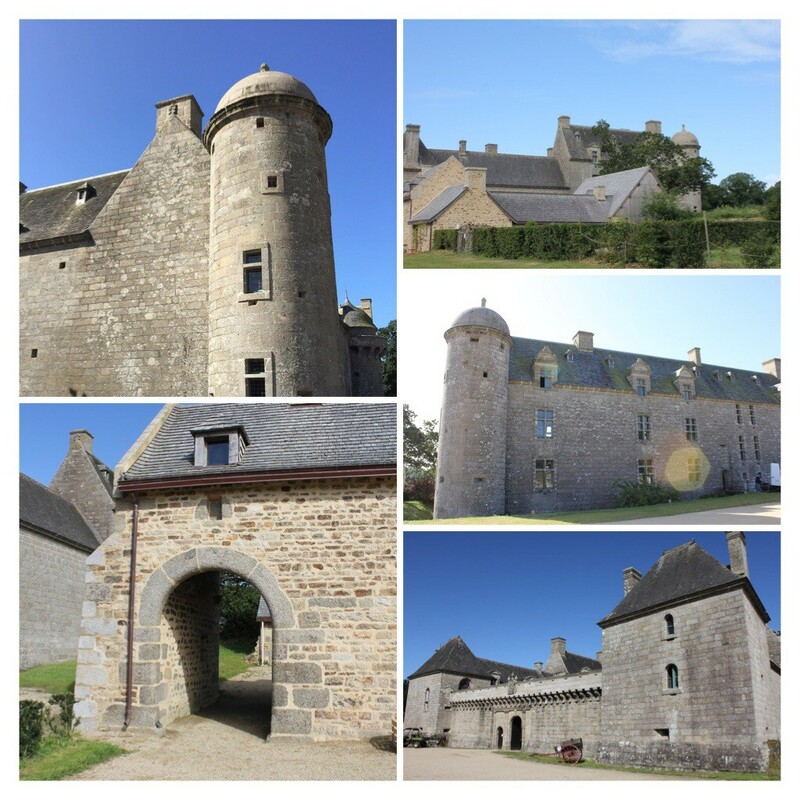 A castle built by a soldier, in a lush and green garden in the Brittany countryside that is full of fascinating items that reveal the history of the people of the area. A functional, rather than beautiful building, château de Kergroadez is structurally as it was built over 400 years ago, and is gradually being rebuilt as a focus point for the community as well as a tourist visitor centre. The château was built by François III who was an active supporter of Henri IV of France during the religious wars, who then rewarded François with making him a Marquis. He was a soldier and his need for order and function, over beauty and frills is clear in the architecture. That having been said, château de Kergroadez has all the typical elements of a castle. Moat? Tick. Drawbridge? Tick. Towers? Tick. Arrow slits? Tick. Current owner Franck Jaclin has worked hard to make the château a centre of entertainment, and sustainability in the community. The vegetables grown in the potager (kitchen garden) in the car park go to the Michelin-starred restaurant in Porspoder, which in turn does the food for wedding receptions held in the château. The donkeys in the château garden keep the potager tidy, and volunteers help to maintain the grounds and animals. There are regular events, such as an Escape challenge, which was just beginning as we finished our tour of the castle. The group had escaped by the time we’d completed our tour of the gardens, and I asked them what they’d thought. Their faces glowed with happiness and excitement; “génial” they grinned, “very good”. Little pots of candles were dotted around as we toured the building, as the day before our visit there had been a candlelit event, where people in costumes had taken small groups of visitors and told them tales in the woods before returning to the château for a party. Our tour was led by the owner, Mr Jaclin, who explained things in a very simple, yet entertaining, manner. The rooms of the château are set up simply, so that you can see what the room was for without it being too over crowded or too theatrical. For example, in the bathroom, a linen rack is enough for Mr Jaclin to explain to us the use of linen in Brittany in the 16th century. There would have been a bath brought into the room and filled with water. Linen would line the bath and the marquis would have the first bath. After they’d finished, the linen would be removed to strain the water and then new linen put in to line the bath for the next user. Baths were taken every one to two months – whether you needed it or not! The rest of the time perfume would be dabbed onto the body using linen cloths. 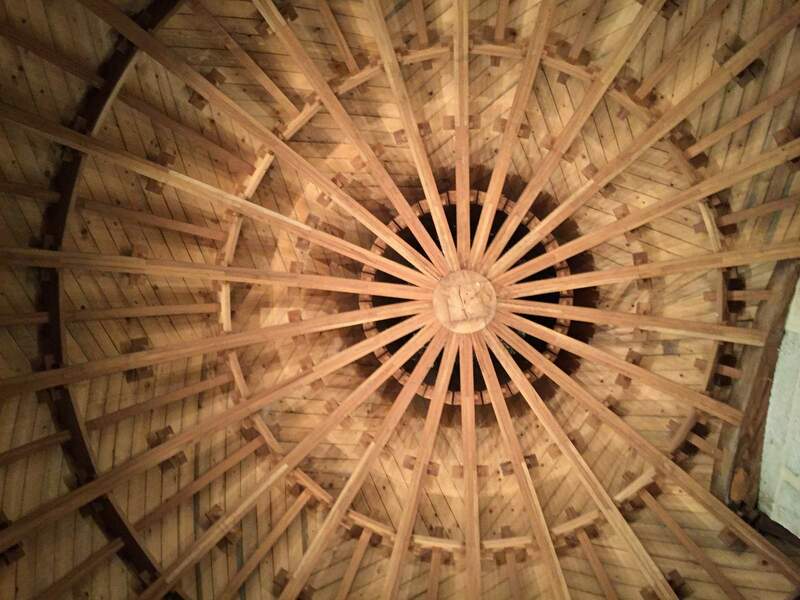 We loved being able to see the structure of the domed roof of château de Kergroadez, which was made by soaking wood to bend it, then slotting it all together. The final piece in the middle holds the whole structure together. We took a brief look outside using the little door, although it was a windy day, and the trees are too high to be able to see much. The view, if there weren’t any trees, would have been of Oussant, one of Brittany’s many islands. When you consider that the building was made by hand in the 15th and 16th centuries, the workmanship is astonishing. 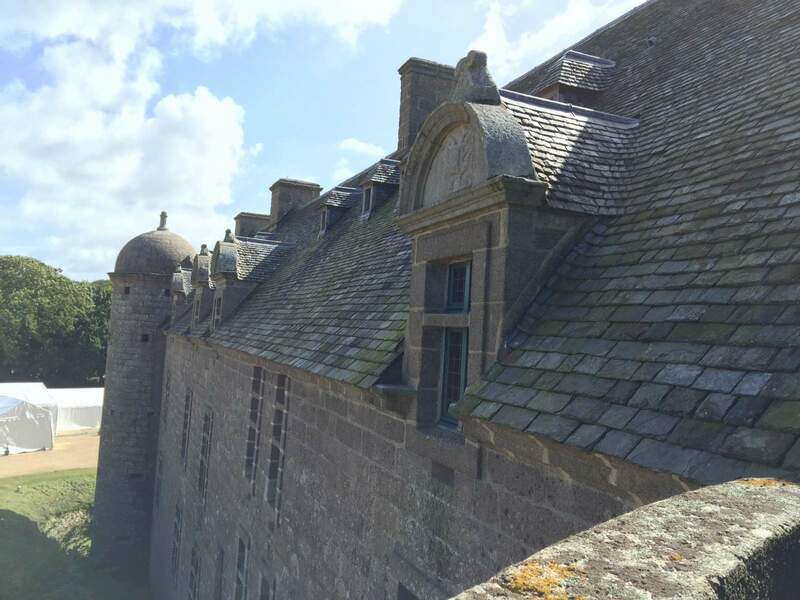 It took 500 men 15 years to build the chateau, and there are beautiful features, like exact curves on the arches above doorways, which would have been chiselled by hand to create the smooth edge. Mr Jaclin has refurbished it as faithfully as possible, though he used cranes and modern machinery to do things like roof replacement. The tour took us into the accountant’s room. Being the accountant for the estate was a very important job, and therefore the post holder would stay in the château. The box bed in the corner of the room revealed that the Bretons traditionally did not lie down to sleep. “The horizontal position is the death position, and we therefore would have sat up to sleep” Mr Jaclin informed us. 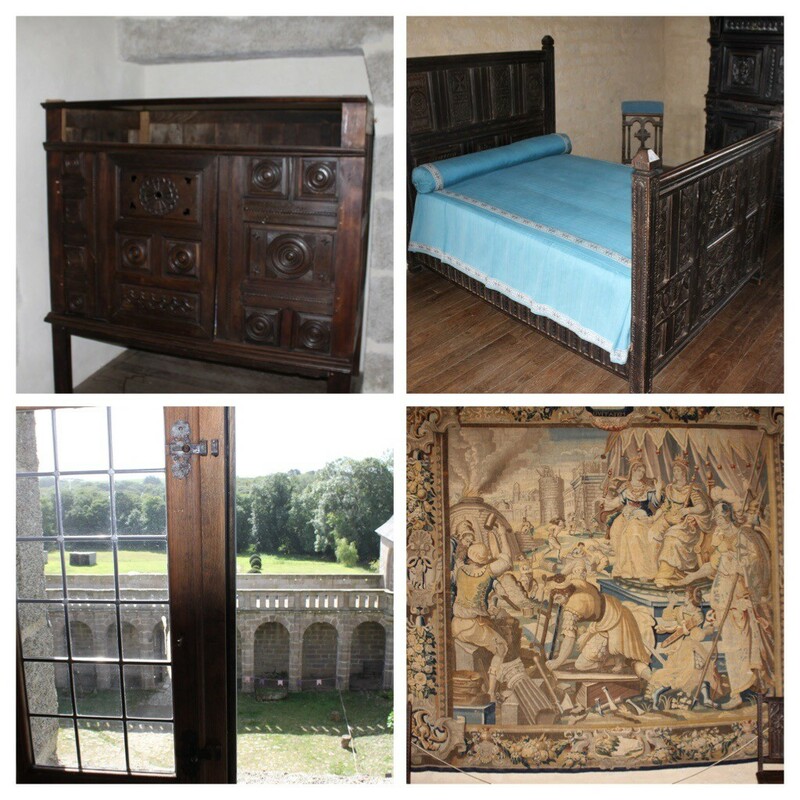 Other examples of these beautifully carved box beds (along with videos of carpenters reconstructing the designs) can be seen at château de Kerjean, slightly north east of Kergroadez. In another room there is a suit of armour, the helmet of which James was invited to try on, but shyness overcame him. The château de Kergroadez will soon be holding special events for children aged 6-10, with a focus on knights and princesses. I have confidence these events will be a great hit if Mr Jaclin is involved; his manner with James was patient and gentle (he has four children himself), and the age range is perfect for such a topic. After our tour we enjoyed absolutely enormous ice creams. Two scoops were more than enough, though I will say don’t try the blé noir (black wheat) flavour unless you really like the taste of playdoh. There’s me trying new things everywhere I go – umm, somethings are meant to remain mysterious. The café is housed in the same building as the gift shop, which is also where you go to pay for your entrance ticket. There is a well-stocked gift shop, with some lovely toys, and puzzles by companies like Djeco. The prices seemed reasonable, although the call of the ice cream stopped me from having a proper browse. We didn’t find it the easiest place to get to, though that might be because our sat nav is in serious need of an upgrade. It just didn’t have the château de Kergroadez listed, and so we had to navigate to the nearest town (Brélès) and follow signposts from there. Parking was free, and in a gravelled area separate from the château. After parking you need to walk up the tree-lined driveway. A visit inside the château requires payment, but you can access the grounds for free. An interesting project to create an arboretum with oceanic trees from all around the world has begun, and will be a great resource to future generations to be able to see a variety of plants from this little corner of France. Tours of the château take place Thursdays and Sundays and are in French, though cards are provided for English and German translations (these must be returned for the next guest). There are two walking tours of the garden (self-guided), through wooded land, and the grounds include a maze. 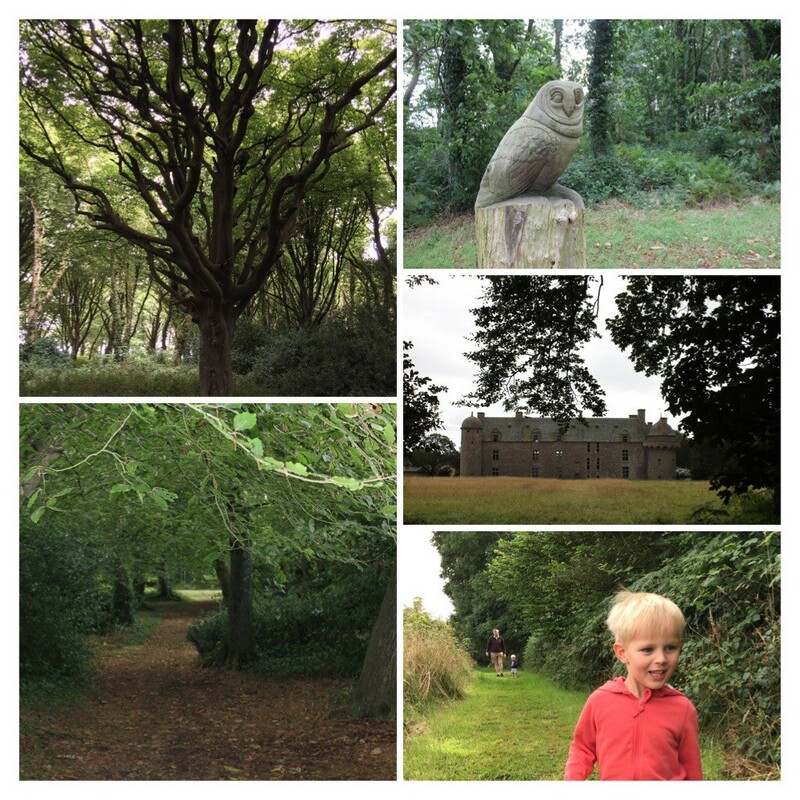 We think this is a really fascinating castle and social development, and very good value for money. 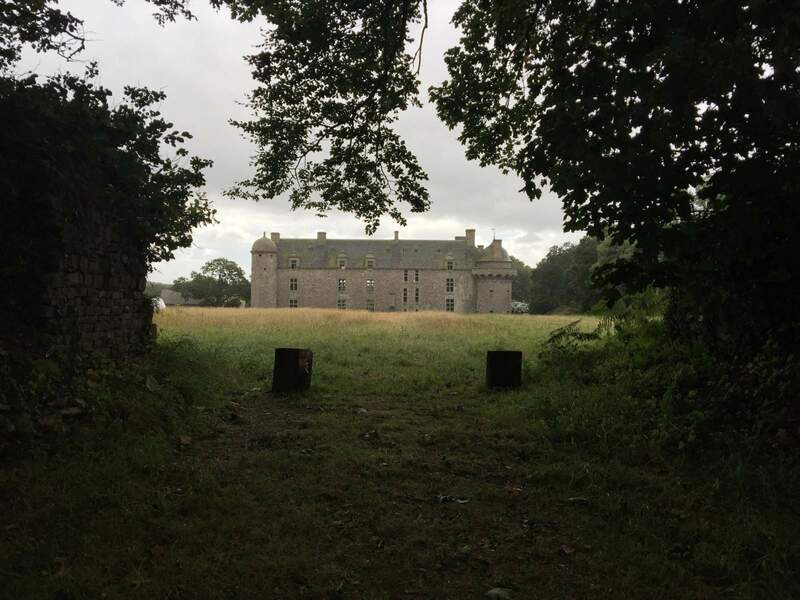 We spent about one hour exploring the château de Kergroadez, and a further two in the grounds, though a sudden storm broke off our outdoor adventures rather sooner than we’d planned. I couldn’t agree more, June! I thought it was a brilliant idea of Mr Jaclin’s and his storytelling while we toured was fantastic.